Every year, L'Artisan Parfumeur releases a limited edition summer fragrance. Last year, it was Ananas Fizz, which has notes of pink grapefruit, bitter orange, lemon rind, rum, rose, Reunion Islands Victoria pineapple, coconut milk, lychee sap, cedar, vetiver, and vanilla. 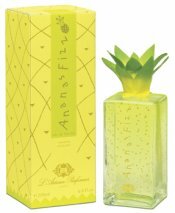 The perfumer for Ananas Fizz was Anne Flipo. I should start by saying that as a rule, I am very fond of the summer L'Artisans. First, the bottles usually score high on the cute factor (I do like the regular L'Artisan bottles, but I have plenty of them and it is nice to see something new). Second, they are often light and citrusy, which is right up my alley, especially in the summer. Third, they are cheaper (per ounce, anyway) than the regular line. Ananas Fizz starts with sparkling citrus; there is a touch of pineapple, but it is subdued, and tempered by a dry woody undertone. It does smell like a fizzy tropical drink, but it is only slightly sweet — it is nicer and more sophisticated than the Kool-Aid punch with rum that I initially feared it might be. As it dries down, it gets softer, and takes on a bit of watery coconut milk and vanilla. The cedar becomes rather pronounced, and right before it fades away there is a hint of vetiver. A tiny bit of pineapple remains right through to the end, but it is a light scent, and the lasting power is average at best for an Eau de Toilette. I love Ananas Fizz, but I know many people who detest it — mulch pile was one of the epithets thrown around on the fragrance boards. So I would have characterized it as a love-it-or-hate-it scent, but since L'Artisan added it to the regular line-up this year, I can only assume it has sold very well. The bottle shown above, by the way, was the limited edition bottle. It ran $110 for 200 ml. You can still buy it in that bottle if you shop around, but otherwise it will be in the standard L'Artisan bottle, and for the same price you will get only 100 ml and no pineapple top. This year L'Artisan released a matching body cream, Creme d'Ananas, and as it happens I got a chance to try it out yesterday (thanks V!). The consistency is just wonderful; the scent is very soft, with less of the fizz and wood and a bit more of the fruit. It layers beautifully with the Eau de Toilette and it does seem to help extend the lasting power. Update: see Anjali's review of Creme d'Ananas. For buying information, see the listing for L'Artisan under Perfume Houses. Love the review! When F. and I went to Aedes, I made a point of revisiting it and ended up liking it very much. Perhaps, I just love the cedar more now than I did when I first encountered Ananas Fizz. I also smelled the new candle (Invitation Creole), and it is absolutely gorgeous–creamy and at the same time sparkly coconut. Ha – can you believe it?? I love this one. I had the opportunity to sniff this with some friends and walk out of the shop in NYC with a nice sample. I then went to join my DH in Madison Sq Park for lunch but I could NOT get my wrist away from my nose so I made my DH drive me back to Soho to pick a bottle up. Thank heavens we found free parking! I was lucky enough to get the limited edition bottle and tons of samples from the lovely SA. The cedar here is not hamstercage but lovely, woodsy and soft. I agree that the pineapple stays softly thoughout but is never cloyingly sweet. Ah – if only I would have come out of my comfortzone last year – but alas – for me it was just a later discovery and one I will enjoy for a long time. Great review R.
V, I have heard that is a wonderful candle. Scared to go check the price! Am already coveting the Bottega Veneta candle that I can't afford. F, As I said to you earlier, I never would have pegged you as an AF fan. Anyway, I am so happy that you wrote this review because I have a large decant of Ananas Fizz, wore it a lot last summer, but have forgotten it for this summer. I need to spritz some on tomorrow! R, My understanding (but all through hearsay — there has not been anything in the press that I have seen) is that AG had already trademarked the name, so they sued & won, and L'Artisan was given a certain amount of time before they had to pull it off the market. I love Ananas Fizz, but can't decide if I will pay double the price when my bottle runs out. Time will tell! Yeahhhhh Robin is back!!!!!!!!!!! Great review! Wish I liked citrussy perfumes – have gone off them. Maybe hormones? Glad to see you! Missed you! Hope you are well and that you had a great time. I only managed to sample Ananas Fizz very recently, and was amazed to find I didn't like it – about the only l'Artisan I haven't liked. I think it's because of the citrussy quality – citrus turns thin and screechy as soon as it hits my skin! A shame – I'm really taken by the packaging and the concept. Sigh. (I did like Extrait de Songe, though – at last, a summer scent that works for me!) N.
Hope my hormones don't follow yours, as citrus is a huge part of my collection! N, I know what you mean about thin & screechy — it is a very high-pitched start. I like high-pitched, luckily. Hope for your sake that they re-issue EdS then! I loved the bottle last year! I agree with VanillaGirl about EdS, though–it is just perfect for a certain kind of summer mood. Hi L! It will be interesting to see if they re-issue it. It was hardly on the market here before it was gone. Thanks M! I had the same reaction initially — another sweet tropical fruit punch, but it is really much nicer than that. If you like cedar, that is. Most of the AF-haters seem to object to the cedar. I am a big fan of light summer scents, so I love lots of the L'Artisans: Fleur de Carotte (no longer in production but still floating around on ebay), The Pour Un Ete (which I will review soon), L'Eau de L'Artisan, Navegar, Tilleuls au Vent (already reviewed). Passage d'Enfer & La Chasse I tend to stop reaching for by August, although neither is exactly heavy. Also tried the new Maitre Parfumeur et Gantier Bahiana yesterday, and think I am going to love that too. Will review it soon. I've tried La Chasse and love it – hope to purchase it one day. I also really liked The Pour Un Ete – just the right blend of jasmine & crisp tea (the light tea notes prevent the florals from becoming overly sweet). Looking forward to your review of this one! I just couldn't get into this one and I am a L'Artisan FIEND! I find my Jo Malone Black Tie and Tiaras works much better for me – pineapple, sandalwood and cedar. You are not alone, I really do know lots of people who hated it. I will be trying the JM soon, thanks to you! does Annick G. have a perfume with the same name Extract de Songe? No, but they had apparently trademarked the name, perhaps for a future product? Just a note-Extrait du Songe is being rereleased under a new name: L'ete un Douce. Enjoy! Thanks, will keep an eye out for it! I ran out of the 2004 limited edition of Ananas and splurged for the 100 mL re-release. There is a slight difference in formulation between the two, since this time around I'm a bit disappointed. Originally, Ananas started with a slight sweetness yet tartiness in its pineapple then faded into its woody notes. It was reminiscent of a pineapple lifesaver. Such tasty goodness! But where did its sweetness go? Ananas, as the re-release of its former greater self, starts off brusquely as a pineapple less ripened. Its also much heavier on the fizz; the fizziness feels like pool water inadvertenly rushing up one's nose. Its cedar notes remain similarly the same if not the same. Ananas' transition from fruit to wood is much less complex making it less dimensional. Hmmn… how peevish. Did anyone else notice? The folks at Bendel's fault my nose for its inaccuracy in judgment while admitting to a slight alteration in Ananas' new formula. Silly bastards, that they are. Why would my nose lie? I forgot to mention that the new Ananas smells more like pineapple soda rather than a pineaplle life saver. Also, please pardon the doubled entry of my previous post, I pressed the wrong button prior to its completed proofread. Deleted the double, so no problem. And soooo sorry to hear they messed with the formula. I still haven't finished my original bottle so had no idea. Wonder if they were trying to make it more concentrated since it is now sold in smaller bottles? Will have to give it a sniff from the new testers next time I'm shopping. From the moment I sprayed this on, I had the strongest “scent-induced childhood memory”…of the bug spray my mother used to spray our rooms with in the summer to kill the mosquitoes before we went to bed. LOL — that will save you some $$!